The complex tectonics surrounding the Philippine Islands are dominated by the interactions of the Pacific, Sunda and Eurasia plates with the Philippine Sea plate (PSP). The latter is unique because it is almost exclusively surrounded by zones of plate convergence. At its eastern and southeastern edges, the Pacific plate is subducted beneath the PSP at the Izu-Bonin, Mariana, and Yap trenches. Here, the subduction zone exhibits high rates of seismic activity to depths of over 600 km, though no great earthquakes (M>8.0) have been observed, likely because of weak coupling along the plate interface. In the northeast, the PSP subducts beneath Japan and the eastern margin of the Eurasia plate at the Nankai and Ryukyu trenches, extending westward to Taiwan. The Nankai portion of this subduction zone has hosted some of the largest earthquakes along the margins of the PSP, including a pair of Mw8.1 megathrust events in 1944 and 1946. Along its western margin, the convergence of the PSP and the Sunda plate is responsible for a broad and active plate boundary system extending along both sides of the Philippine Islands chain. The region is characterized by opposite-facing subduction systems on the east and west sides of the islands, and the archipelago is cut by a major transform structure: the Philippine Fault. 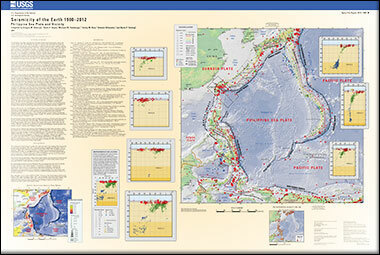 Subduction of the Philippine Sea plate occurs at the eastern margin of the islands along the Philippine Trench and its northern extension, the East Luzon Trough. On the west side of Luzon, the Sunda Plate subducts eastward along a series of trenches, including the Manila Trench in the north, the smaller Negros Trench in the central Philippines, and the Sulu and Cotabato trenches in the south. Twentieth and early twenty-first century seismic activity along the boundaries of the Philippine Sea plate has produced seven great (M>8.0) earthquakes and 250 large (M>7) events. Among the most destructive events were the 1923 Kanto, the 1948 Fukui, and the 1995 Kobe, Japan, earthquakes; the 1935 and the 1999 Chi-Chi, Taiwan, earthquakes; and the 1976 M7.6 Moro Gulf and 1990 M7.6 Luzon, Philippines, earthquakes. Smoczyk, G.M., Hayes, G.P., Hamburger, M.W., Benz, H.M., Villaseñor, Antonio, and Furlong, K.P., 2013, Seismicity of the Earth 1900–2012 Philippine Sea Plate and vicinity: U.S. Geological Survey Open-File Report 2010–1083-M, scale 1:10,000,000, https://dx.doi.org/10.3133/ofr20101083m.